New Quietvox audio systems are freeing up Silver Spirit’s guests to fully enjoy select shore tours in the Mediterranean this summer. The new technology eliminates the need to huddle around the tour guide to hear what’s being said. With a transmission range of up to 1,000 metres ( 3,280 feet) tour participants may now walk about freely, untethered to their guide, to explore some of the world’s great attractions — from museums and cathedrals to vast ancient ruins — without missing any of the guide’s valuable insights. Wearing a single personal earpiece connected to a small wireless receiver, each guest is able to easily hear the guide’s commentary without being distracted by the sounds of other tour groups, resulting in an enhanced shore experience. 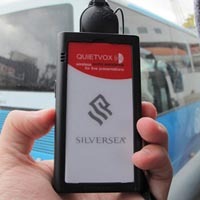 Tours offering the new audio system are depicted as “Silver Shore Sotto Voce” options in online and print materials provided to Silver Spirit guests. They are denoted by a small headset-shaped icon in the Silver Shore Journals, the shore excursion booklets guests receive with their cruise documents. The devices will be available on select tours in all the regions where Silver Spirit sails and eventually will be expanded to other ships in the Silversea fleet.